I finally decided to pick up the much hyped about and sold out OPI Black Shatter the other day. I'm so glad I did because it's awesome!! I decided to layer it over my GOSH Holographic NOTD I showed you previously. My hands look a bit lobster-ish for some reason oops! Application was perfect. I used 1 thin coat of Black Shatter and it shattered almost immediately. The combination of holo and shatter looked fantastic! My camera didn't pick it up that well though doh. Do you have Black Shatter? What's your favourite layering combination? I forgot to mention that Aysh is giving away a bottle of the awesome GOSH Holographic on her blog!!! If you'd like to win a bottle of this must have polish head over and enter here. I've never tried it before, but its definitely something I'll have to buy in the near future! I LOVE IT! Honestly, this is the BEST shatter NOTD I've ever seen! 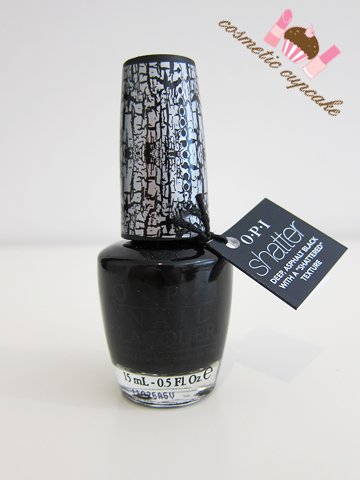 That looks great, I really want to try the OPI black shatter as I'm not really getting on with the Barry M one. I just got shatter, along with the whole Katy Perry collection (I love it all). Have only used it with the one that got away. You're shattered into much smaller sections than mine. Do you know how to control that? Wow yours looks cooler than the other ones I see... maybe you put a thinner layer than they did... I love yours! how cool! Nice combination this black and white mani! Greetz Kirst. aww thank you so much huny! :) and OMG it looks amazing over the holo! haha it looks just like the lid! :) I love using my black shatter over metallics, looks awesome! This is nice Chelle! I haven't tried using any shatter or crackle nail polishes...what would you recommend for beginners like me? This is really better en sweeter then China Glaze! Now I think I love these the most! :( :( :( this is meant to be on it's way.... but I don't think the Ebay seller has posted it :( :( :( and she won't reply to my emails. I'm so sad :( :( :( I really, really want to try it! o~ I like how your shatter polish shattered! Amazing! You got like a hundred tiny crackles per nail LOL! I always thought that the Black Shatter is a damn ugly nail polish. Until I saw your swatches <3! It looks just perfect on your nails! Wow, OPI Black Shatter really...shatters. So much more than other crackle polishes. I can't say I'm loving the trend though, especially here where it's so cracked! @Alex: Thanks Alex! The silver holo and black is just a great combo. I really recommend you try it! @Rachel Marie: It's pretty much completely sold old here too. I had to hunt it down and I managed to pick up the last 2 bottles (1 is for a friend!). I hope you find it soon!! @Salla: Yes I know what you mean! I have the Pink Isadora shatter and it's much much chunkier than OPI's Shatter. @Cherry Pullinger: Unfortunately my bottle of Barry M Effects is unusable so I can't compare but I've read they are very similar. @christine: Thanks Christine!! =D I only have Teenage Dream from her collection which I've yet to try in combination with Black Shatter. I'd like to try the CG ones too! @Jess: Oooh nice! I only have Teenage Dream as the other colours didn't really scream out to me =p Yes mine shattered very finely compared to the loads of swatches I've seen online! I only used a very thin layer. @Clamaresa: Thank you for your kind words! Maybe you can buy it online..? @caroleen: You must get your hands on it! Instantly cool nail art hehe. @Aysh: You should try it over the GOSH!! It's sooooo cool. @Shirley's Nail Art: I haven't tried the China Glaze crackles yet so I can't compare yet unfortunately! But Black Shatter looks fantastic and is so easy to use. It's great! @sincerelylucky: Oh you are very sweet! Thank you for your kind comment =) I think the silver and black just works so well. @Spaceinvaders: LOL I know huh! The other swatches I've seen haven't looked like this! @gabiarchanjo: I'm good thank you! I hope you're doing well too =) I used a very thin coat of Black Shatter and it turned out like this. I haven't really experimented much with it so I'd suggest playing around with it! @Tamara: Awww thank you Tamara!! I'm so flattered ^_^ It's seriously a must have polish - the effect is so cool and it's so easy to use! @Joan: Crackle polishes aren't for everybody ;) For some reason my swatch cracked loads more than other pics I've seen. Must have been the very thin coat I used.